Will it revolutionise the way we do our weekly shop? 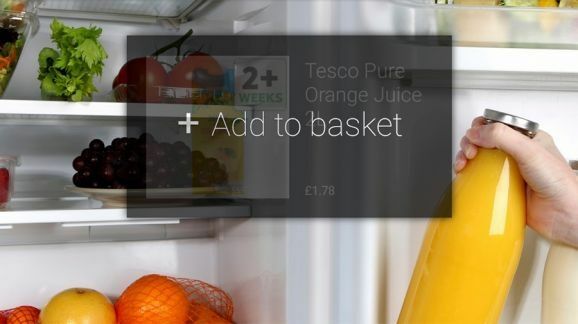 Tesco has launched a new app for Google Glass, becoming the first major UK retailer to do so. The app, Tesco Grocery, connects to an existing Tesco.com account, letting customers create a shopping list, and then ordering the products, quickly and easily. But are we really likely to use it? The embrace of one of the UK's largest supermarkets for wearable technology certainly could usher in a revolution for how we shop for food and essentials. The idea behind the app is that you could open your fridge and while wearing Google Glass view the contents. If you're running low on an item such as milk, all you need to do is look at the barcode. The Google Glass app will scan it and then add it to your virtual shopping basket. You can also use voice controls to search and order food, drink and more via Google Glass. If you don't mind looking a little odd as you talk to your fridge, it could be a real time saver. The Tesco Grocery app can also highlight nutritional and price information for products you look at, and can even compare brands to help you get the best deal. Like all good supermarkets, Tesco has an experimental technology laboratory. Pablo Coberly, Innovation Engineer at Tesco Labs, promised that this is just the beginning for the Tesco Grocery app, with more features set to follow. Supermarkets are in a cut throat industry, and many are relying on technical innovations that claim to make your shopping trip easier, but are really designed to entice you to shop at their stores rather than their competitors. Here are some of the coolest tech you'll soon be seeing during your weekly shop. Many of us are all too familiar with the “unexpected item in the baggage area” cries of a confused self checkout having a strop. However Tesco is introducing high tech replacements that will scan 60 items per minute. The checkouts will place the items on the conveyor belt into one of three packing areas, which will allow three sets of customers to use each machine at one time. ASDA thinks the process of scanning your shopping is too slow, so it has created a Rapid Scan 360-degree scanner tunnel to boost the speed by 300%. Just unload your shopping onto the conveyor belt and it will be sped through the system – just make sure you're fast enough to catch it at the end. Why wait until you reach the checkout to scan your items? Sainsbury's is piloting a mobile phone app that lets you scan while you shop. It tracks your spending so there are no nasty surprises at the end, and lets you pay for your goods without having to unload your basket or trolley.